Home Africa	Where Is Gbenga Obasanjo? Gbenga Obasanjo, son of former president, Olusegun Obasanjo has managed to stay off the media completely since his very messy divorce with his wife. However, the divorce was not as messy as the events preceding the collapse of their barely four-year-old marriage. Gbenga had accused his father, Olusegun Obasanjo and his wife’s father, Otunba Alex Onabajo of sleeping with his wife. According to him, his wife has confided in him that she had been sexually abused and defiled by her father on several occasions and his attempt to forcefully put an end to it severed the ties between him and his father-in-law. In his petition against his wife, he accused his wife of committing adultery and having a sexually intimate relationship with his own father, General Olusegun Obasanjo, in order to get contracts from the government and she got rewarded with several oil contracts with the NNPC from his father, amongst which was the NNPC Consultancy training in supply chain management and project management awarded to her company Bowen and Brown. He also requested that the paternity of his two children be tested and a DNA test be carried out on himself, Otunba Alex Onabanjo and General Olusegun Obasanjo in order to ascertain the actual paternity of the children of the marriage. After this reveal, Gbenga was tagged crazy for levelling such an allegation against his father and father-in-law. Some people requested that the DNA test is carried out on him to determine if he is truly Obasanjo’s son rather than on his children. Gbenga and his ex-wife eventually agreed to settle out of court in order to reduce the embarrassment the divorce brought to both families. He reportedly married a new wife in a low-key ceremony attended by only a few of his trusted friends and his wife, Moji is also now married to Mustapha Akinkunmi, the Commissioner for Finance in Lagos State. Gbenga’s name last found its way into the media in October 2013 when an Associated Airline plane bearing the remains of the late former Ondo State governor, Dr Segun Agagu crashed, claiming many lives. He was rumoured to be among those who died in the crash until it emerged that he did not make the trip. Every other thing about him has been a mystery since then. Olatorera Consultancy Limited is a new-generation consulting company providing business development and consulting services to established companies and high net-worth individuals. Olatorera Consultancy provides critical and analytical services to companies under our radar to enable them innovate and serve their clients more effectively and efficiently using digital resources and modern strategies. Olatorera Consultancy provides the seal and stamp of Africa’s Best to enable great companies compete stronger on a global scale. Olatorera Consultancy publishes an annual list of “Africa’s Best 100 Companies” and “Africa’s Best 100 Leaders”. Alex onabajoGbenga ObasanjoMoji ObasanjoMustapha AkinkunmiOlatorera ConsultingOlusegun ObasanjoWhere is Gbenga Obasanjo? Nigeria Economy: Is The E-Commerce Business Sustainable In Nigeria? 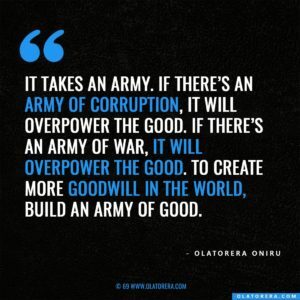 Politics & Corruption Nigeria: Where Is Idahosa Okunbo?